Use these instructions to convert Dollar Store placemats into a banner that will transform a live dove into a silk handkerchief OR a small plush animal into a silk handkerchief OR a dove into a rope OR a red silk into a blue silk OR a dove into gloves OR a dove into a flower (or flowers) and so on. Transforming small objects by tossing them up into the air is exactly what this Dove to Silk Mat does best! BONUS EFFECTS: Use your mats to make several variations of Dove Production mats and even a Dove Color Changing Mat - sort of like a Dove caught in the middle of a Blendo! Our instructions will guide you through fitting Dollar Store items together to make a Magic Milk Pitcher that vanishes milk, but once we have started you down the road to Do-It-Yourself (DIY) magic, you may just find you want to keep going and make our BONUS effects, too! BONUS EFFECTS: Make a Foo Can, a Lota Bowl, or even a Ghost Tube from the same Dollar Store products with minor adjustments Or go crazy and build your own Multim In Parvo set of glasses.. Learn how to turn an UNGIMMICKED regular plain ordinary Dollar Store tote bag into a Magic Changing Tote Bag. Then learn how to make a gimmicked version that can even be used with live doves! BONUS EFFECTS: Turn your Tote Bag into a Dollar Store Blendo Bag; Tote Bag Topit; Spotty Tote; and my personal favorite - The Diminishing Nested Tote Bags. Turn a Dollar Store clear plastic canister (about the size of a cookie jar) into a Magic Candy/Cookie Jar! Some children find candy in the jar, while others find nothing. However, at the end, you hold the jar over an empty candy bowl and enough candy tumbles out of the jar for each person to have a piece. BONUS EFFECTS: Turn your Canister into a visible silk appearance trick - the sealed canister suddenly becomes filled with silks, or in reverse the silks are sealed into the canister and suddenly they vanish. This can also be used as a visible transformation of silks changing to a live dove, flowers, candy, cookies, oranges, etc. What can you do with a Dollar Store Broomstick? Quite a lot, if you follow our instructions! You can make it appear, disappear, sweep the floor by itself, and even fly around the room! BONUS EFFECTS: Cut up your broomstick and make even more magic; a dancing cane, a break-away wand, a silk vanishing wand, and more wands than you can shake a stick at! The Dollar Store is full of materials for making gimmicked Salt and Pepper Shakers, and even Sugar Shakers, Parmesan Cheese Shakers, and shakers for other spices (including Magic Woofle Dust!). This article will explore how to make magic props with some of each. How many Mental Magic effects can you make from items you find at the Dollar Store? We'll give you a dozen! In no time we'll have you reading minds, making predictions of future events, divining the location of hidden objects, performing sightless vision tests and more! The origin of Passé Passé magic begins with the traditional bottle and glass. The trick was already as old as the hills when it was first described in print by Professor Hoffmann (c. 1876). Let's see how many different ways we can re-invent this old classic, using stuff from the Dollar Store! Magic performed with Greeting Cards is the ultimate form of Pack Small- Play Big magic. You have instant recognition even for very small children, who have been receiving cards with their birthday presents since year one. And you can end up with a souvenir of your show for someone by simply delivering the card (ungimmicked) after you have performed with it. Somewhere on the card, you have printed your contact information, because this is the kind of souvenir that gets shared with others. Routines are included for Birthday Cards, Christmas Cards, Get Well Cards (good for hospital shows, too! ), Thank You Cards and many other occasions. Unlike the other Dollar Store effects above that are made from plastic bottles and saltshakers, etc., all of the effects in this article are made from transparent plastic Party Cups. Dollar Store Magic Book 1 - in Print! 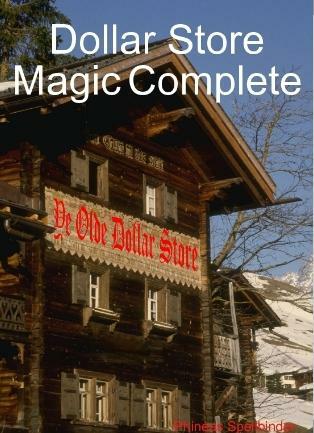 All 10 chapters of Dollar Store Magic Book 1 are now available as a fully printed paperback from Lulu.com: 282 pages, 8.5" x 11", perfect binding, full-color interior ink - $90.00 plus shipping. Lulu.com accepts PayPal as well as individual Credit Card orders.